Lenexa is located in northeast Kansas and is in the central part of Johnson county. The population in Lenexa is about 50,000 residents according to the 2010 census. Lenexa is about 12 miles south of Kansas City, Missouri. The city has a healthy business base and has a variety of high tech and bio-science companies, as well as several national and international headquarters. 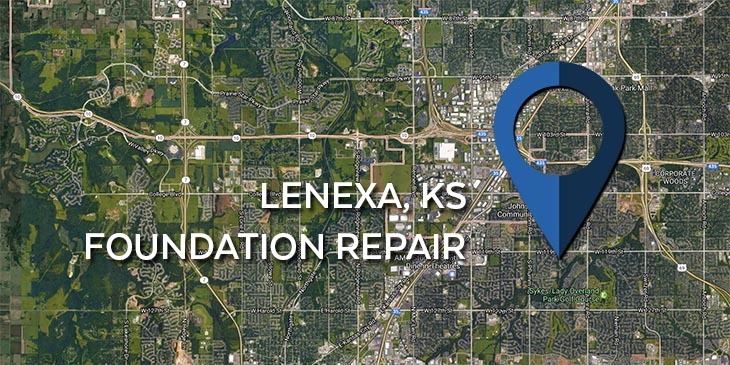 For those who reside in the area, KC Pro proudly does foundation repair in Lenexa, KS and the surrounding area to ensure a safe living environment. KC Pro is a full foundation repair company. We are your premium service provider of basement waterproofing, concrete repair and installation, mudjacking, and foundation repair. We provide quality work that is done quickly and holds permanently. Details matter with your home because it is what keeps you safe from storms and keeps a roof over your head for shelter so it needs to be sturdy. For those who live in Lenexa if you find that your home has foundation problems such as cracks, leaning walls or chimneys, or a sinking foundation, then you need to have a professional take care of the issue. KC Pro proudly provides foundation repair and for the surrounding areas for your home. Your foundation issues can be solved by KC Pro so that your home can continue being safe and sound for everyone. Soil-related disturbances tend to be a large factor when needing foundation repair. Poor compaction, overloading, and excessive materials that expand and shrink with the changes in the moisture content greatly impact the amount of stress on your home’s foundation. KC Pro has several foundation repair systems to overcome the damage already done. Water takes the path of least resistance, meaning, if your foundation has cracks then you can be almost certain that moisture will find its way into your home. Moisture brings its own batch of problems along with it, including mold growth, wood rot, and potential belonging damage. The longer you leave your foundation cracks unattended the higher your chance of water seepage. You’ll want a qualified basement waterproofing contractor to make your home safe and dry. The professionals at KC Pro take care of all your basement waterproofing needs. We have many waterproofing services so that you do not have to worry about your basement every time the heavy rains come. Whether you need exterior waterproofing or wall crack injections, we have you covered. Trust us with your basement waterproofing problems so we can take care of them the first time.